The houses on Hutchison Street have stayed pretty much the same. The occupants have come and gone, although some people have lived there for decades. The gradual increase in the Hasidic population is the most obvious change. […] That’s what makes Hutchison Street so unique, a street split between Mile End and Outremont. Between Yaveh, God, Allah….or none of the above. The book is tied together by the common threads of excerpts from the diary of Hinda Rochel, a young Hasidic girl and Françoise Camirand, a successful author who has lived on Hutchison Street for years, and who has decided her next book will be fictional stories about the people she sees every day on her street. She [Françoise ] flitted like a butterfly from one character to another, from her notebooks to her characters. From the street to her computer. She had files full of notes taken haphazardly as she read, as she walked around. She would grapple with one of the characters, then embrace one of the others. She was moving forward in baby steps. One word here, one sentence there. Rewrite a section, fix another, polish many… Sentences, ideas, emotions and images swirled around in her brain pell-mell. The time it took to decide which character went with each of these, they vanished … and then returned even more distinctly… She would then put them down on paper, telling them, “wait, your time will come.” By protecting them from oblivion, she felt calm, and so were they. Emotions can wait until we arouse them. Characters appeared and took shape. She continued to stroll up and down Hutchison Street, from Van Horne to MontRoyal and back. Sometimes she took Park Avenue on the way home. Hinda Rochel loves to read, but she worries about the predetermined future that awaits her as a Hasidic wife and mother. She sees no way out of it at the moment and fears that no one understands her. 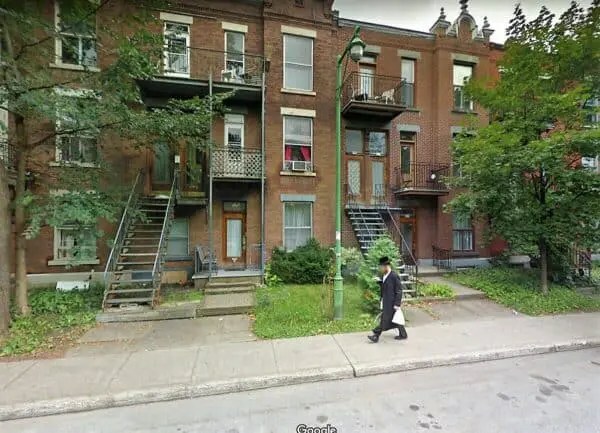 Françoise, on the other hand, desires to get to know more about the Hasidim way of life but wants to get it first hand, not via what she can find on the Internet. IWhile she awaits an opportunity to speak to one of the many Hasidim, she writes about every possible type of person that lives in this multicultural area of Montreal: actors, musicians, Willa, a woman who wants to know what goes on inside a synagogue, a reclusive woman who feeds birds and squirrels in the back alley, Albert Dupras, the vitriolic theatre critic, three Greek sisters and many more. It was a real joy to read Hutchison Street, for all the stories were more or less told in a positive light, and the majority of the street’s residents were more than happy to live there. For anyone who has lived in a multicultural neighbourhood, Hutchison Street will undoubtedly bring back some memories. I rated it four stars at Goodreads and I will put it on my 2019 longlist for “The Very Best!” Book Awards for Fiction. *Please note if you choose to purchase this book through Amazon using the link below I will receive a small commission at no extra cost to you. If you cannot see the Amazon ad below (if you are using an ad blocker, for instance) here is the link: https://amzn.to/2CanhM7 Thanks!